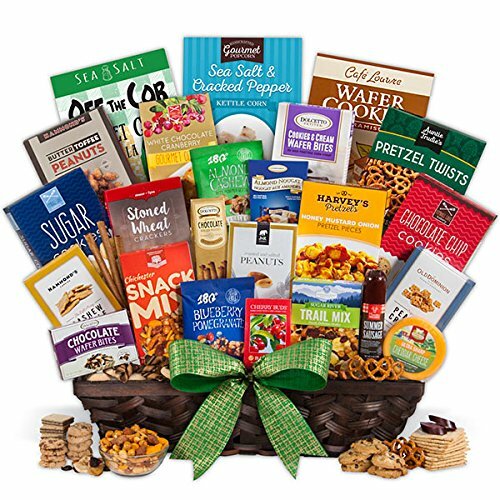 This ultimate Snack Gift Basket is guaranteed to impress! Artfully arranged inside a gorgeous lattice basket, your recipient will find an unparalleled collection of coveted gourmet snacks. Complete with a variety of delectable treats, including delicate cookies, handcrafted popcorn, and toffee dipped peanuts, this stunning gift is sure to please at any occasion. Exclusively from GourmetGiftBaskets.com! This ultimate Snack Gift Basket is guaranteed to impress! Artfully arranged inside a gorgeous lattice basket, your recipient will find an unparalleled collection of coveted gourmet snacks. Exclusively from GourmetGiftBaskets.com! cookies & cream wafer bites, strawberry banana Sugar River Trail Mix, ultra sharp cheddar cheese, stoned wheat crackers, white chocolate cranberry cookies, honey mustard & onion pretzel pieces, almond nougat & cherry hard candies! Keepsake basket with snacks is shrink wrapped with festive ribbon.